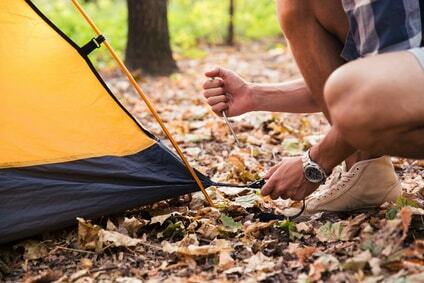 ​So you have had an awesome and hopefully, relaxing time on your camping trip. Now it’s time to pack away your equipment, get back to reality and start dreaming about your next camping adventure! But before you throw your camping gear back into the storeroom, you might want to think about doing a few things that can help make the packing of your next trip even more efficient! ​Packing your car for your camping trip is almost like playing Tetris; trying to make sure everything fits in its right place, without it falling out, blocking the rearview mirror, or getting stuck in the car door! Once you have perfected the art of packing your camping equipment in the car, it will be handy to take a quick picture so you can replicate it for the next time. Especially if you’re in a hurry! There’s also the simple pleasure of trying to improve your process and pack it even more efficiently next time. Packing your car for your camping trip is almost like playing Tetris; trying to make sure everything fits in its right place, without it falling out, blocking the rearview mirror, or getting stuck in the car door! Once you have perfected the art of packing your camping equipment in the car, it will be handy to take a quick picture so you can replicate it for the next time. Especially if you’re in a hurry! There’s also the simple pleasure of trying to improve your process and pack it even more efficiently next time. ​We know it’s the last thing you want to do after a camping trip, but when you get home you do want to lay everything out and make sure it is all dry before rolling it up and packing it away. Good quality tents will last years, even decades, but you will need to lay it out and dry it thoroughly. This is also a good time to clean, and do any necessary repairs. If you leave little rocks, or dirt on the fabric of your tent, and roll up the tent, then these tiny little objects will act as sandpaper and over time will rub and tear your tent! Make sure you also lay out your bedding, sleeping bags, sleeping mats etc. preferably in the sunshine to air out. You don’t want mold, or the bedding to get musty. We know it’s the last thing you want to do after a camping trip, but when you get home you do want to lay everything out and make sure it is all dry before rolling it up and packing it away. Good quality tents will last years, even decades, but you will need to lay it out and dry it thoroughly. This is also a good time to clean, and do any necessary repairs. Make sure you also lay out your bedding, sleeping bags, sleeping mats etc. preferably in the sunshine to air out. You don’t want mold, or the bedding to get musty. ​When everything is laid out to dry and air out, you will also want to double check there is no major damage to your camping gear. Check your matches, firelighters, cooking equipment, clothing, shoes, etc. for water damage or holes. Clean the zips on your equipment, and make sure there is no salt residue, otherwise this may damage your kit, and you won’t be able to use it next time. Repair any damaged equipment, and use waterproof spray if necessary, so that it’s ready for your next adventure. There’s no worse feeling that going on an impromptu camping trip and realizing your hiking boots have a loose sole, or you hiking pants have a large hole in the crotch! We love this KIWI Heavy Duty Water Repellent. Perfect for coating our jackets, boots, and most importantly, our tents before the next trip! Now that you’ve checked your equipment, it’s also a good time to check your supplies. Double check your First Aid Kit, bathing supplies, cooking supplies, etc. This makes it so much easier, and saves lots of time, for when you do start to plan your next camping trip! 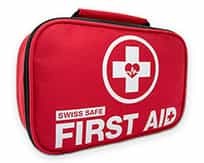 This is an excellent First Aid Kit by Swiss Safe, complete with an emergency blanket! Soft packaging so you can stuff it into your backpack. It even comes with a mini kit for those short hikes! It’s never too early to start planning your next Not Quite Wild adventure! When you get home from your camping trip, this is the best time to reflect on your trip and see what you could improve; what you need to bring next time, any unnecessary items you don’t need to bring (to lessen the load! ), things that worked (eg. meals, games, activities etc.) or things that didn’t work. Planning your trip is usually half the fun, and something to look forward to! When everything is laid out to dry and air out, you will also want to double check there is no major damage to your camping gear. Check your matches, firelighters, cooking equipment, clothing, shoes, etc. for water damage or holes. Clean the zips on your equipment, and make sure there is no salt residue, otherwise this may damage your kit, and you won’t be able to use it next time. Repair any damaged equipment, and use waterproof spray if necessary, so that it’s ready for your next adventure. There’s no worse feeling that going on an impromptu camping trip and realising your hiking boots have a loose sole, or you hiking pants have a large hole in the crotch! Now that you’ve checked your equipment, it’s also a good time to check your supplies. Double check your First Aid Kit, cooking supplies, bathing supplies etc. This makes it so much easier, and saves lots of time, for when you do start to plan your next camping trip! ​Let us know in the comments below what your top tips are ​when you get back from a camping trip. ​After a hot bath of course! So you’ve had an awesome and hopefully, relaxing time on your camping trip. Now it’s time to pack away your equipment, get back to reality and start dreaming about your next camping adventure! But before you throw your camping gear back into the storeroom, you might want to think about doing a few things that can help make the packing of your next trip even more efficient!